Happy swooning, everyone! With it being so close to Valentine's Day, I am excited to share with you guys my first fictional crush. Now, this is a guy you probably remember from days long ago. He was brave and selfless and a bit of a budding bad boy with a heart of gold (he had a whole tortured artist vibe). And did I mention he suffered a brutal tragedy that gutted him and left me in literal tears (this was the first time I ever cried while reading a book. That guy? Jess Aarons from BRIDGE TO TERABITHIA. He was the first boy to make me swoon, the first boy to make me cry, and the first boy to leave me feeling hope and satisfied at the end of a book. So, who was the first (fictional) boy to make you swoon? 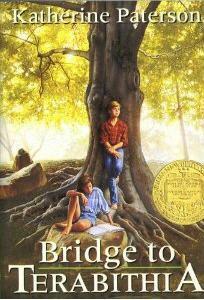 I was just thinking about Bridge to Terabithia a couple of days ago--it also left a HUGE impact on me as it was the first book I ever cried while while too. My parents asked me what was wrong and when I told them, they were like, "Oh, we thought something was really wrong!" Well, something was--my friend who I had grown to love just died!!! Katherine Paterson is such a powerful writer! Mr. Darcy from Pride and Prejudice. My wife says James Bond. Jamie from Outlander! I've loved him for many years. I like James Bond .007 the most of the ones who are Swoony.